Attention to all of the proud cat ladies who previously expressed enthusiasm for freaky feline art projects: your pleas for an English version of Crafting With Cat Hair have been heard. 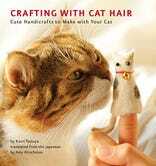 Catsparella reports the book is already available for pre-order on Amazon, and the authors have a special request. Have fun, ladies. And to those who balked at my initial disdain for fur crafts, I'll admit that I do have a tuft of my late cat's hair ... but I'm still not going to make a finger puppet out of it.